This is a fascinating place to visit. I am on a visit to the Mornington Peninsula, so I drive inland from Dromana and follow the country road for about 10 minutes towards Red Hill. 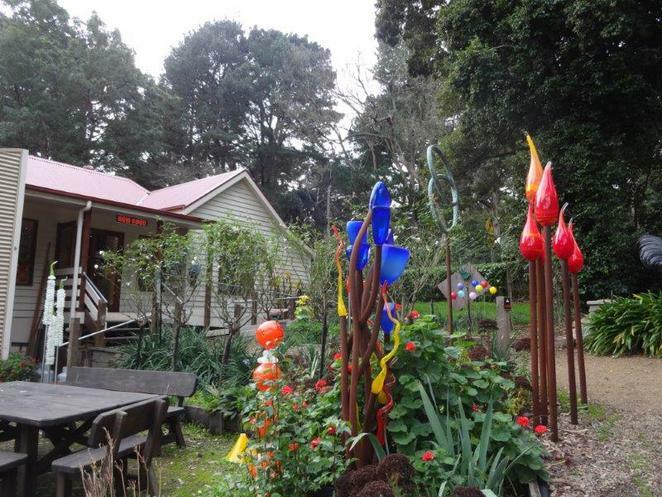 At the corner of Dunns Creek and Red Hill Roads I find the Gordon Studio. It's a converted farmhouse set back from the corner a little and as I drive into the carpark I have a good view of the surrounding green valley. 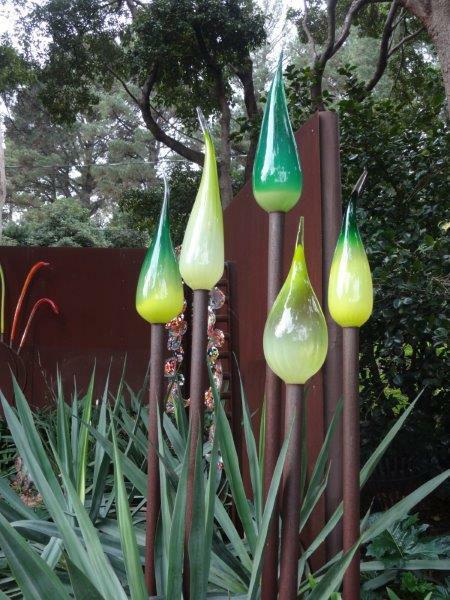 The short path to the studio features several glass artworks in the garden - the shapes in each piece are fascinating. The studio is run by the Gordon family - a celebrated "glass family" in Australia. Daughter, Eileen Gordon has worked in England and around Australia and Grant Donaldson is a farmer recently turned glass artist. Their work is unique and beautiful. As I approach, I see an open studio on the basement level, but also see a "No admittance" sign there. So I scale three stairs and enter the retail part. The atmosphere is calm and pleasant. Once inside, on my left is a balcony that overlooks the operating glass blowing studio that I saw from outside. There are furnaces, anvils, tools and heat rises from the face of each open furnace. I watch as the craftspeople work the red-hot, molten glass either by blowing down the pipe, or using tools and heat-resistant cloths to shape the material into intriguing and beautiful items. Their designs feature many colours and are often in almost gravity-defying shapes. The range of articles they produce is broad - from tiny pieces of jewellery, pendants, ornate trinkets, paper weights and shelf sculptures right through to the magnificent garden pieces that will the viewer to tell their own story, so free and fluid are the designs that there would be many interpretations of each piece. It's beautiful. The retail store has wares that range in style and price so it's easy to find both keepsakes for myself or gifts here. It's a good visit. The studio is open daily from 10.00 am to 5.00 pm, but the glass blowers don't work in the studio on weekends (apart from Queens Birthday weekend, in June, when there is a huge festival in the area).